Product #31855 | SKU LP380RW | 0.0 (no ratings yet) Thanks for your rating! 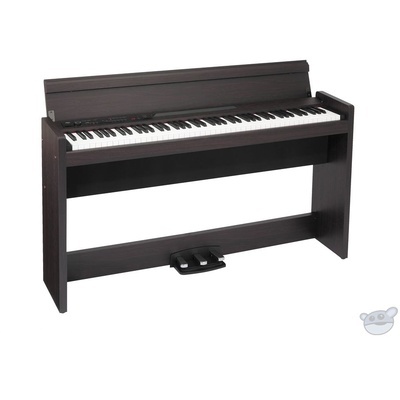 The rosewood LP-380 from Korg is a slim, digital piano featuring a rich piano sound, one-piece stand, keyboard cover, and a three-pedal unit that supports half-pedalling. The instrument covers all the bases when it comes to piano-style performance, including the Real Weighted Hammer Action 3 (RH3) keyboard that is accurately weighted like a traditional piano keyboard. The keyboard can be split or layered, and three levels of Key Touch Control allow the keyboard response to be matched to nearly any playing style. The pedals, playing feel, and sound are just as solid. Thirty sounds are available, including piano, electric piano, vibraphone, pipe organ, strings and choir. Reverb effects add depth, a chorus effect provides a spacious feel to the sounds and a brilliance control adjust brightness. Two headphone jacks allow for private practice. MIDI I/O allows for controlling external peripherals such as sound modules, and for the instrument itself to act as a 16-part sound module.